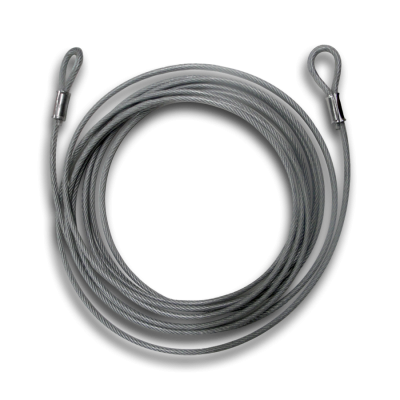 This 30 foot x 3/8 inch galvanized man-toy lasso cable is made from wound galvanized steel, making it harder to cut. It has an outer layer of clear PVC coating to protect objects from marring or scuffing while it's in place! At each end of the cable are loops intended to go around the MegaHitch's bolt-ball. The length of cable between the loops goes around toys and secured goods. The items are now secured with one key and do not take a combination to unlock using the MegaHitch method. With the MegaHitch Lock, it's as easy as 1-2-3! 1. Secure wire around unprotected items. 2. Install loops over the MegaHitch Lock bolt-ball. 3. Attach the MegaHitch coupler vault to trailer coupler. Use for camping trips, trailering, RV adventures and more!